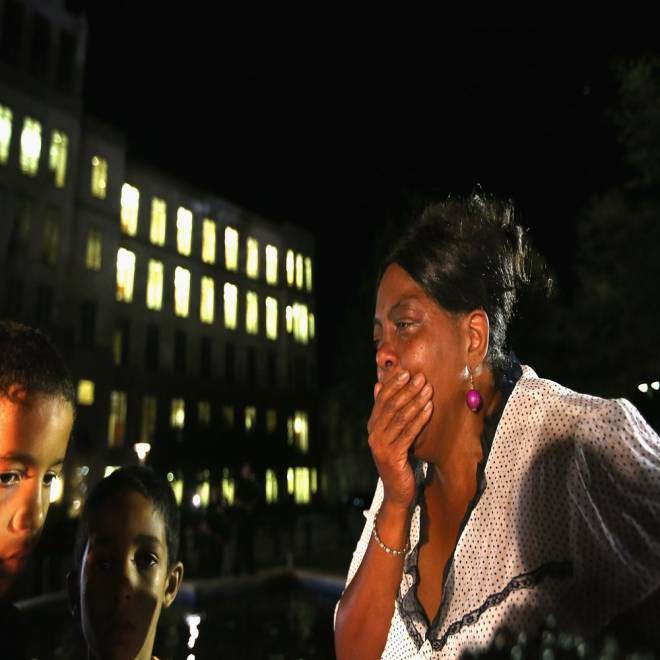 A stunned Carmen Taylor bursts into tears in front of the Seminole County Criminal Justice Center after learning George Zimmerman had been found not guilty in the death of Trayvon Martin on July 13, 2013 in Sanford, Florida. President Obama called on the nation to honor Trayvon Martin a day after George Zimmerman was acquitted of his murder by asking "ourselves if we're doing all we can to stem the tide of gun violence." "I now ask every American to respect the call for calm reflection from two parents who lost their young son. And as we do, we should ask ourselves if we're doing all we can to widen the circle of compassion and understanding in our own communities," Obama said in a statement on Sunday. "We should ask ourselves if we're doing all we can to stem the tide of gun violence that claims too many lives across this country on a daily basis. We should ask ourselves, as individuals and as a society, how we can prevent future tragedies like this. As citizens, that's a job for all of us. That's the way to honor Trayvon Martin." His comments contrasted with bold statements from others that followed the verdict. “Hallelujah!” tweeted conservative lightning rod Ann Coulter, a Zimmerman supporter, just minutes after the not-guilty verdict was announced. Rep. Steve King, R-Iowa, said he thought Zimmerman should never have even been prosecuted. "The evidence didn't support prosecution, and the Justice Department engaged in this. The president engaged in this and turned it into a political issue that should have been handled exclusively with law and order," King told "Fox News Sunday." King was referring to comments Obama made nearly a month after the fatal Feb. 26, 2012, shooting, when he weighed in the controversy, calling it a tragedy and adding, "If I had a son, he'd look like Trayvon." On Sunday, the president reiterated that 17-year-old Martin's death was a tragedy, but asked for calm. "The death of Trayvon Martin was a tragedy. Not just for his family, or for any one community, but for America. I know this case has elicited strong passions. And in the wake of the verdict, I know those passions may be running even higher. But we are a nation of laws, and a jury has spoken," his statement said. Some used the day following the verdict to argue the prosecution had made unwise decisions. In an op-ed in USA TODAY, George Washington University professor of public interest law Jonathan Turley criticized state attorney Angela Corey for "overcharging the case as second-degree murder" from the start and ripped into the prosecution's choice of witnesses. "The prosecution clearly made its share of mistakes such as leading its case with the testimony of Martin's friend, Rachel Jeantel. Jeantel was a disastrous witness who had to admit to lying previously under oath and produced conflicted testimony," Turley wrote. Zimmerman, 29, was acquitted of all charges on Saturday night. In addition to second-degree murder, the all-women, six-member jury was also given the option of convicting Zimmerman of the lesser crime of manslaughter. "Even though I am broken hearted my faith is unshattered I WILL ALWAYS LOVE MY BABY TRAY. God blessed Me & Sybrina with Tray and even in his death I know my baby proud of the FIGHT we along with all of you put up for him GOD BLESS." Trayvon Martin's brother, Jahvaris Fulton, said on Twitter: "Et tu America?" — a reference to the Latin phrase ‘Et tu, Brute?’ popularized by Shakespeare’s Julius Caesar, which is known as an expression of betrayal. The family attorney said the Martins were in church on Sunday. "Right now they're trying to make sense of this all," said Benjamin Crump, the attorney for Trayvon Martin's family. He said the family would be attending church Sunday. TODAY's Lester Holt interviews Benjamin Crump. "They are trying to make sense of it all, as many around the country are this morning," Benjamin Crump told TODAY. "Now they're just putting their faith in a higher authority." Crump added that it wasn't clear at this point whether the family would file any further civil action against Zimmerman. In a news conference outside their Miami Gardens, Fla., church on Sunday, Trayvon Martin's cousins said they were proud of "the Trayvon Martin movement." "My heart is heavy," said Milton Felton. "[But] I'm very proud of the Trayvon Martin movement. All tragedies are converted to a good and positive nature." Aisha Felton, 35, said the family's faith has helped them. "That’s what’s going to keep us strong and keep us peaceful," she said. Inside her church, “you can feel the sadness of people, but you can also feel the strength of the community coming together to hold one another up,” she told reporters. George Zimmerman attorney Don West. says, "I think the prosecution of Zimmerman was disgraceful. I am gratified by the jury's verdict." Outside of the Sanford, Fla., courthouse where the trial took place, anger was laced with confusion among the dozens of Martin supporters gathered there. "How the hell did they find him not guilty?" asked Andrew Perkins, 55, a black resident of Sanford, so mad that he was shaking. "He killed somebody and got away with murder." Kayla Alexander, another Sanford resident, was more reserved. “The verdict is the verdict and it can’t be changed, but I think as a community we have to pull closer together and try to make sense of everything,” she told NBC's Ron Mott on TODAY. Celebrities also reacted. Beyonce called at a Nashville concert for a moment of silence for Martin before singing the chorus of "I Will Always Love You" and then her hit "Halo." Rapper Young Jeezy released a song in Martin's memory and hip-hop mogul Russell Simmons called for peace. Among others calling for peace was the Rev. Jesse Jackson, who tweeted: "Avoid violence, it will lead to more tragedies. Find a way for self-construction not deconstruction in this time of despair." Meanwhile, an NAACP petition calling for the Justice Department to press civil rights charges against Zimmerman was met with such a flood of signatures, it toppled the NAACP's website, said Derek Turner, NAACP director of communications. The petition, which Turner said went up about 15 minutes after the 10 p.m. verdict, got about 250,000 signatures before NAACP.org's servers went down from the increase in traffic sometime in the 2 a.m. hour. The site was down for about 12 hours, but Turner said the petition was also available on MoveOn.Org in the meantime. New York City Mayor Michael Bloomberg, an outspoken proponent of gun control laws, was also quick to react. "Sadly, all the facts in this tragic case will probably never be known. But one fact has long been crystal clear: 'shoot first' laws like those in Florida can inspire dangerous vigilantism and protect those who act recklessly with guns. Such laws - drafted by gun lobby extremists in Washington - encourage deadly confrontations by enabling people to shoot first and argue 'justifiable homicide' later," he said in a statement on Sunday, adding he would continue to work to eliminate such laws. For Zimmerman's family, the verdict brought relief. "Message from Dad: ‘Our whole family is relieved. Today... I'm proud to be an American. God Bless America! Thank you for your prayers!’" Zimmerman's brother, Robert, said in Twitter post. He was more reserved later said on CNN, saying, "I don't think this is a time for high-fiving." Robert Zimmerman Jr., also noted that his brother may never escape the social consequences of the shooting. "He's going to be looking over his shoulder the rest of his life," Zimmerman Jr. said during the interview on CNN. Jurors deliberated for about 16 hours over two days before announcing late Saturday night that they had reached a verdict. Defense attorney Mark O'Mara said in August 2012 that Zimmerman and his wife, Shellie, had been living "like a hermit" and weren't working because they feared for their safety. "We're ecstatic with the results. George Zimmerman was never guilty of anything except protecting himself in self-defense,” he said.